Product prices and availability are accurate as of 2019-04-19 02:43:14 UTC and are subject to change. Any price and availability information displayed on http://www.amazon.com/ at the time of purchase will apply to the purchase of this product. Carhartt Hunt Wear, ready for a DIFFERENT kind of hard work. 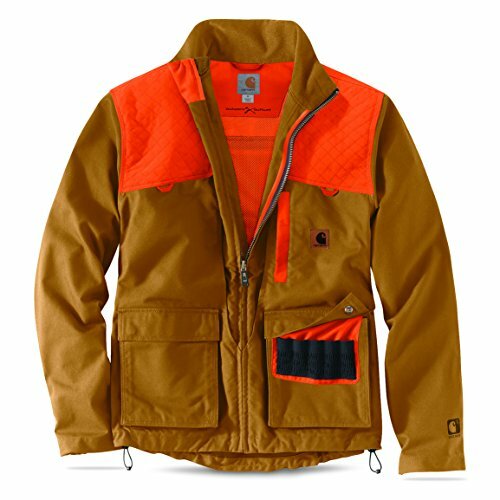 The Carhartt Upland Field Jacket, perfect for guys who work hard during the week...and just as hard chasing birds on the weekend! It's made from 8.5-oz. Quick Duck canvas that delivers classic Carhartt durability -- but in a lighter, more field-friendly weight. So you can walk all day through cornfields and endless sage without being weighed down, and pull your gun up to your shoulder without restriction. Lots of nice features, too. Like an easy-to-clean wraparound game pouch that fits 3 roosters. Two, smartly placed water bottle pockets. Front pockets with storage for 10 shells in each. Zipper map pocket on the chest. And more. Turns out Carhartt knows birds like they know work. Rain Defender Durable Water Repellent finish keeps water beading off; 8.5-oz. 60/40 cotton/poly Quick Duck canvas fabric is lightweight yet durable; Front-loading game bag holds 3 roosters, and opens up for easy cleaning; Lightly padded shooting shoulder for added comfort; Two front flap pockets with shell storage each hold 10 shells; Zipper map pocket on the chest; Two back water bottle pockets for staying hydrated; Drop-tail hem with adjustable drawcord bottom for added coverage and easy cinching; Adjustable sleeve openings with hook and loop closure for cinching; Unlined; Full zipper front; Imported; Fabric: 8.5-oz. 60/40 Quick Duck canvas; Fabric finish: Rain Defender DWR; Game bag size: Fits 3 roosters; Insulation: Uninsulated; Pockets: 2 flap shell pockets, 2 side-entry hand pockets, zipper chest pocket; Special features: 2 water bottle pockets, drop-tail hem; Mfg. Number: 102800.